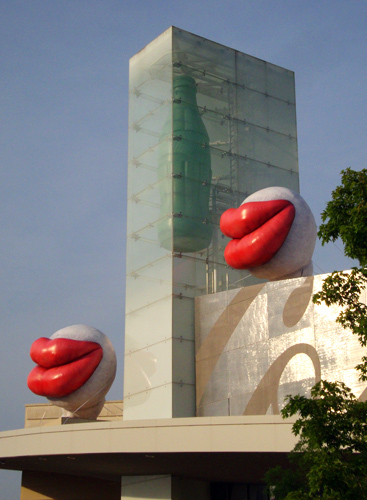 The World of Coca-Cola has two pair of giant red lips sitting on top of its building. The first time I saw them I thought to myself, "What in the world...?" When it dawned on me that the giant red lips are cast members of Coke's 4D movie experience, "Coca-Cola Happiness Factory," it totally made sense. Clever advertising, I think. Those giant red lips certainly piqued my curiosity...and now I'm more enticed to go back, just to see what else is going on for Coke's 125th anniversary. One thing I've heard about is their new six-minute animated film "Happyfication." I wonder if the giant red lips will be adding this film to their resumes. Haven't seen the lips. I have a feeling they might be seen further abroad. Don't get the lips. Didn't get the movie either. Had nothing to do with coke. And what is up with the characters Wendy? She looks like a male anatomy part. What is she suppose to be?